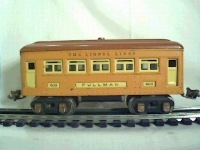 In 1924, Lionel introduced the classic period passenger cars. 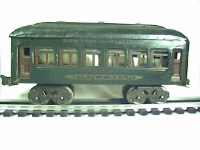 The first cars introduced were the 710, 712.These two cars were the largest O gauge passenger cars Lionel ever made. In fact they are so big, they look like small standard gauge cars. Also introduced in 1924 were the 629, 630 small four wheel cars. These cars were the first cars to have inserted name and number boards. In 1925 Lionel introduced the 605, 606 cars and upgraded the 629 cars to 529, 530 by adding mottled celluloid to the upper windows. 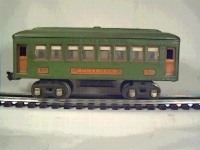 In 1926, Lionel the replaced the early bodied 610, 612 cars with new improved versions. I will add pages covering the early period trains in the future. Also in 1926, Lionel introduced the 607, 608 medium sized cars. Over the next 16 years the 607 car body was also used on the 603, 604 cars (no interior lights) and the 609, 611 (uncataloged-no journals, air tanks or fishbellies, with or without lights). These other cars result in many different variations. All of them are shown on the 607 page. In the photographs above are early and late body cars. The early body cars are on the left. The late body cars are on the right. Notice the added journals, and inserted name and number boards on the late body cars. 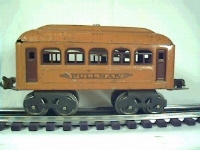 The 603 Pullman car dates are from the introduction of the 607, 608 cars which used the same body. The later cars also have air tanks underneath them. Some 603, 604 cars used in uncataloged sets do not have air tanks. See the 603, 604 listings for more information. The following prewar passenger car pages will be added in the near future. Terry.